To help raise awareness for the Mega Man Legends series, the folks behind Get Me Off the Moon are on a mission to translate Rockman DASH: Great Adventure on the Five Islands in its entirety. The project won't be a game translation in the traditional sense. Instead, Cap Kobun and members of Team Japan will be capturing footage of the game -- from start to finish, cutscenes and gameplay -- and subtitling it in English. All footage will be direct feed, meaning it is pulled straight from the game without the use of a camcorder. While audiences outside of Japan still won't get to play the game, the video anthology will ensure all fans an opportunity to enjoy it from a visual perspective. It'll be like watching a movie! You can see some test direct-feed footage here. The dialog has not been transcribed just yet, but it's on the burner. Again, this is all happening thanks to the likes of Team Japan. As stated in a previous Roll's wrap-up, the project is a gift of sorts to the English-speaking fanbase. 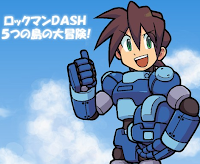 "For working hard to bring Mega Man Legends 3 back to the forefront of the fan community, I'd like to show you my appreciation from the bottom of my heart,"writes Team Japan. Well, isn't that a lovely gesture! Future updates on the project will become available at Team Legends' official FaceBook page. I, for one, am looking forward to it! much rather play the game, but ok.
i applaud this effort. though i can't help, i wish i could. I read it's Suzukaze Yuya doing the work on this project, Not CAPKobun. Not a big deal tho. The footage looks great. All I can say is, it's about time. Just to let you know, Heat Man of TMMN is in Japan right now had given "a detailed report" of this game and has recently provided a translation of Chapter 1's script. Yes, this is a canon game, sort of like a Legends 1.5. I've heard though that it is fairly simplistic, even though the graphics are pretty nice for a mobile game like that, but I suppose at the moment it's the closest thing we have to a "new" game to obsess about (even though it was released back in '08). This is great work. I'd be very grateful just for the chance to see the game. As a sidenote, I really wish more stuff like this got done by japanese-speaking fans. Even bare translations of some of the stuff would be great. I know that, if all japanese gaming stuff was somehow in spanish, I'd be out there translating all kinds of things for fans of different communities. This is a glorious gift and they should feel awesome for doing this. Mega Man fans are awesome. i like the idea, but translating the game in a video format? This is awesome! I'll almost certainly watch the whole thing from beginning to end.